Reacting to serious crashes in each of the season’s first two races, NHRA officials have notified all competitors of a revised rule change regarding centerline crossing and/or the striking of timing blocks. Crossing the centerline and/or striking timing blocks is a serious safety concern and causes delays in racing due to cleanup time required for such incidents. In addition to the current centerline policy of disqualifying runs/times, additional penalties will be imposed on drivers crossing the centerline or striking the timing blocks during any qualifying or elimination round. The following penalties will apply to all drivers in every NHRA category contested at each NHRA national event. _ A driver’s first violation of the season will result in the loss of five (5) NHRA series points. _ A second violation of the season will result in the loss of ten (10) NHRA series points. _ All subsequent violations of the season will result in the loss of fifteen (15) NHRA series points per violation. 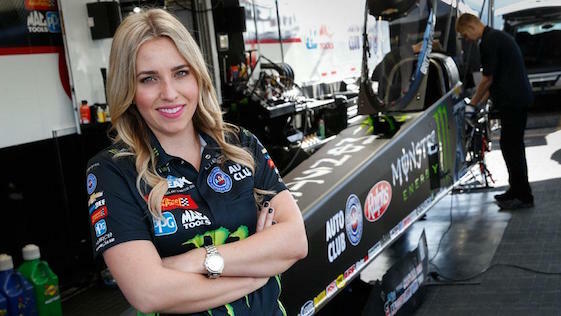 The update follows separate crossing-the-line crashes involving reigning Top Fuel world champion Brittany Force and her father, 16-time Funny Car world champ John Force, during the first two races of the 24-event NHRA Mello Drag Racing Series season. Force, the second woman to win a Top Fuel championship, began her title defense at the season- opening Lucas Oil Winternationals on Feb. 9 in dramatic fashion. Two hours after receiving her world championship ring and jacket, Force was involved in a horrific crash racing beside Terry Haddock. Force’s Monster Energy dragster careened across the track at Auto Club Raceway and then barrel-rolled. Force escaped serious injury but did spend one night in the hospital for evaluation and to manage some serious bruising. “Brute” Force’s race day at Wild Horse Pass Motorsports Park ended when his car’s nitromethane-fueled engine grenaded during the second round of eliminations on Feb. 25 in Chandler, Ariz., outside Phoenix. Force won the round before the bullet in his PEAK Coolant and Motor Oil Chevrolet Camaro SS detonated, shredding bodywork and sending the chassis out of control from the left lane. Force’s chassis made contact with the retaining wall and then collided with opponent Jonnie Lindberg’s car and parachute in the opposite lane. Lindberg’s Toyota Camry bodywork also flew into the air and both chassis _ tangled together by their chutes _ came to rest against the left lane retaining wall. Lindberg exited his car under his own power while the NHRA Safety Safari carefully helped Force out of his cockpit. As a precaution, the 68-year-old legend was transported to Chandler Regional Hospital for evaluation before being released Sunday evening. He returned to Wild Horse Pass after racing had ended to congratulate daughter Courtney, who defeated Tommy Johnson Jr. of rival Don Schumacher Racing in the Funny Car final. The incident was eerily similar to an engine explosion the elder Force experienced during his second Friday qualifying pass at the season-opening Winternationals on Feb. 9. The revised rule change encompasses the distance from the starting line to the quarter-mile finish line at 1,320 feet. Top Fuel and Funny Car drivers crossing the centerline after the 1,000-foot finish line but before the 1,320-foot finish line WILL be subject to the point penalty. However, they will not be subject to the standard disqualification/loss of elapsed time policy for this specific violation. In the case of an oil-down plus a centerline/timing block violation in the same run, the oil-down point policy (and DQ of the run) will apply. It will not result in a double point penalty. Crossing the centerline on a burnout will not be considered a violation. The tour returns to action this weekend with the 49th annual AMALIE Motor Oil NHRA Gatornationals at Gainesville Raceway. The event in Florida is the traditional East Coast season-opener as well as the opening race on Pro Stock Motorcycle’s 16-race schedule. Tony Schumacher (Top Fuel), John Force (Funny Car), Shane Gray (Pro Stock) and Eddie Krawiec (Pro Stock Motorcycle) were last year’s winners of an event that will be televised on FOX Sports 1, including finals coverage on Sunday at 7 p.m. (EDT). The Gator Nats also is the season-opening race for the E3 Spark Plugs NHRA Pro Mod Drag Racing Series presented by J&A Service. The schedule also features competition in the NHRA Lucas Oil Drag Racing Series, as well as the Mickey Thompson Tires NHRA Top Fuel Harley Drag Racing Series. Professional qualifying will open with rounds at 1:15 and 5:00 p.m. (EDT) Friday, with the final two sessions Saturday at noon and 3:00 p.m. Final eliminations are scheduled for 11 a.m. Sunday. Top Fuel _1. Steve Torrence, 183; 2. Doug Kalitta, 144; 3. Tony Schumacher, 140; 4. Scott Palmer, 139; 5. Antron Brown, 133; 6. Clay Millican, 122; 7. Leah Pritchett, 90; 8. Brittany Force, 86; 9. Billy Torrence, 71; 10. Greg Carrillo, 66. Funny Car _1. Matt Hagan, 179; 2. Courtney Force, 160; 3. Ron Capps, 139; 4. Robert Hight, 133; 5. Tommy Johnson Jr., 128; 6. Jack Beckman, 122; 7. Jonnie Lindberg, 107; 8. Shawn Langdon, 104; 9. J.R. Todd, 83; 10. Cruz Pedregon, 82. Pro Stock _1. Jason Line, 195; 2. Deric Kramer, 154; 3. Chris McGaha, 152; 4. Bo Butner, 149; 5. Alex Laughlin, 136; 6. Erica Enders, 134; 7. Greg Anderson, 119; 8. Drew Skillman, 117; 9. Vincent Nobile, 95; 10. Jeg Coughlin Jr., 84.